Your office, whether it be your home office or business office, is sure to be filled with several pieces of office furniture. While each piece is necessary for your office to function properly, some pieces are more essential than others. Your office desk is one of the most important pieces of furniture for your office. Without your office desk, you would have no space to actually conduct your work. How many drawers will I need for my paperwork and supplies? What kind of business will I be working on at my desk? Will I need two computer monitors? How much space do I have to work with in my office? Will I have any other supplies or appliances on my desk other than my computer? Answering these questions can help you determine the size and type of office desk you require. 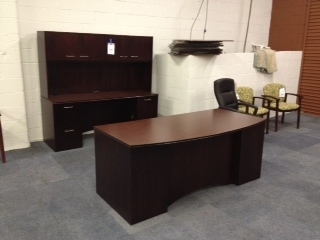 You never want to purchase an office desk that won’t be able to successfully fit into your office space. You also don’t want to purchase a piece that won’t be able to support your equipment for your work. If you plan on eating or drinking at your desk often, consider purchasing a piece that has had a treatment to avoid damage caused by spills. If you aren’t sure about the type of office desk to purchase, ask the trained staff members at Mark Downs Office Furniture. This entry was posted on Wednesday, April 22nd, 2015 at 2:26 pm. Both comments and pings are currently closed.